MEXICO CITY — The wiggling fingers of a young girl trapped in the rubble of her collapsed school in Mexico City raised hopes and prodded rescuers to work furiously hour after hour early Thursday — a drama that played out at dozens of buildings toppled by a powerful earthquake that killed at least 245 people. Mexico City Mayor Miguel Angel Mancera said late Wednesday that two women and a man had been pulled alive from a collapsed office building in the city's center. But it was the rescue operation at the Enrique Rebsamen school, where at least 21 children and four adults perished in Tuesday's quake, that was seen as emblematic of Mexicans' rush to save survivors before time runs out. Hours later the crews were still laboring to free her as images of the rescue effort were broadcast on TV screens nationwide. At one point, the workers lowered a sensitive microphone inside the rubble to scan for any noise or movement. A rescuer said they thought they had located someone, but it wasn't clear who. But some 15 hours into the effort, Adm. Jose Luis Vergara said rescuers still could not pinpoint Frida's location. "There's a girl alive in there, we're pretty sure of that, but we still don't know how to get to her," Vergara told local broadcaster Televisa. "The hours that have passed complicate the chances of finding alive or in good health the person who might be trapped." 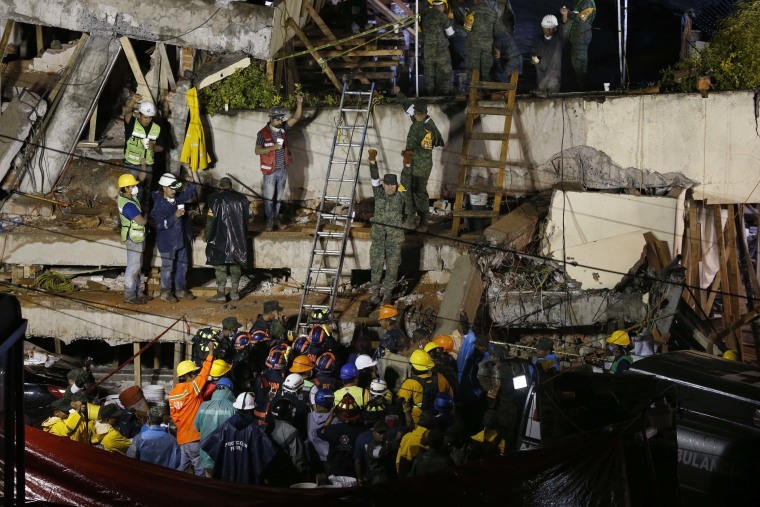 As with other disaster sites throughout central Mexico, officials dared not employ heavy lifting equipment for fear of crushing anyone below. Similar efforts were continuing at the scenes of dozens of collapsed buildings, where firefighters, police, soldiers and civilians wore themselves out hammering, shoveling, pushing and pulling debris aside to try to reach the living and the dead. Power was being restored in some Mexico City neighborhoods that had been left in darkness overnight, and officials reported that the sprawling Metro system was running at near-normal capacity.